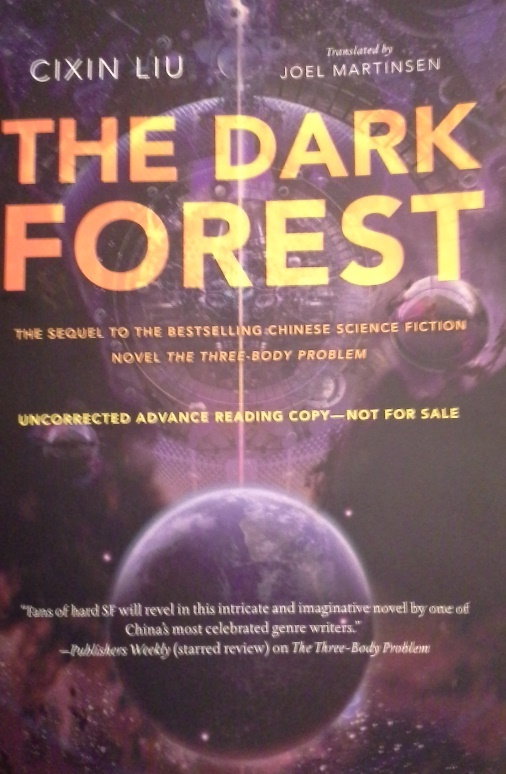 A while back I won a first-read copy of Cixin Liu’s science fiction novel The Dark Forest. It’s the follow-up to his book The Three Body Problem, which just won a Hugo Award. I haven’t read The Three-Body Problem yet, and it took me a while longer than I had hoped to get around to reading The Dark Forest (mainly because I went away on holidays and forgot the book at home…). I’m about 3/4 of the way through the book now, and a review is coming once I’m finished, but this is definitely a book that sets your mind spinning. The first half of it is like a good science fiction novel: good story, original concept, set mostly in almost-present-day. And then, about halfway through, the book kind of seems to shake itself, shed some of its previous “ordinariness” and just… well… go a bit nuts. And that’s the moment when this book becomes really, really, really interesting. Any science fiction book that makes you go “wtf is going on here? !” is a worthwhile read. Like I said: full review coming, but I already know that I will be reading The Three-Body Problem at some point after this. Check my Reading List for all my book reviews and recommendations!